Carriers are pulling return of premium (ROP) term products or raising rates significantly because of pressure on reserves and possibly because of an NAIC rule going into effect the end of this year. So far, ING is canceling its basic ROP term option, Genworth is withdrawing its product and AIG’s American General is raising its rates by about 50 percent. Many expect more of the same in the coming months, with some making even more dire predictions. Writing about tax-deferred annuities creates tremendous possibilities for misunderstandings and misleading uses of the information. So let me start with a series of warnings. Much like the label on your prescription medicine, these warnings inform you that the product within is designed to be a benefit, but only if you take it as directed, and avoid using it under the wrong conditions. A majority of Americans are afraid they will never be able to retire, according to a new survey. The 401(k) Participant Attitudes, Behavior and Intentions study --released this past week by Barclays Global Investors-- reveals that 80% of 401(k) plan participants polled said they are worried they will never be able to retire. More than half (58%) said they now plan to work until they die, while the remainder of respondents said they are delaying their retirement indefinitely. In case you hadn't noticed, Twitter is everywhere these days. The social-networking phenomenon has attracted endless amounts of publicity, with celebrities ranging from Oprah to Ashton Kutcher now beaming out the ultra-short updates known as tweets. But can Twitter help you invest? Increasingly, financial types from economists to actual traders are blasting out their thoughts on Twitter (always in 140 characters or less, of course). There are also free sites like StockTwits.com that compile Twitter postings on financial news, individual companies and broader market issues. Some of the updates are compelling -- but as with so many other forms of digital communication, there's a lot of dross out there, too. A full-page ad in the Chicago Tribune invited people age 50 to 85 to come hear football great Mike Ditka and learn "WHY WALL STREET WANTS TO BUY YOUR LIFE INSURANCE POLICY." The ad shows how a murky and potentially risky market for life insurance has been pitched to vulnerable consumers, an Illinois regulator told a Senate panel yesterday. Members of the Senate Special Committee on Aging yesterday expressed concern about dangers for senior citizens from what the hearing agenda described as "Betting on Death in the Life Settlement Market." Panel Chairman Herb Kohl (D-Wis.) said selling a life insurance policy to investors "can be fraught with possible hidden pitfalls..."
Name Hurts Main Unit of A.I.G. NY Times: Name Hurts Main Unit of A.I.G. My last column discussed specific actions our firm is taking as the economy and markets have become more challenging. Now it's clear that the economic situation is not the result of a single-point crisis that will quickly pass; my quick-response solutions won't suffice long term. Global economic woes will result in significant changes in the regulatory, financial and business landscapes of our industry. Blogging from the Conference in Palm Springs, Calif. The broad decline across financial markets in the past year has persuaded a small but growing number of financial advisers to abandon the traditional buy-and-hold strategy -- which emphasizes long-term investing in a mix of assets -- for a new approach geared to sidestep future market plunges and ease volatility. Jeff Seymour, an adviser based in Cary, N.C., used to counsel clients to buy a diverse menu of stocks, bonds and commodities, and hold on for the long run. But early last year, he says, he recognized that "the macro-economic climate has changed..."
Activist shareholders win major victory as bank names board member Walter Massey as new chairman; Lewis to remain as CEO. Bank of America CEO Ken Lewis was stripped of his title as chairman following the company's annual shareholder meeting Wednesday... Bank of America shares have lost three quarters of their value since the Merrill Lynch deal was announced in September. Bank of America chief executive officer Ken Lewis was ousted from his role as chairman of the bank after shareholders approved a proposal to require that the company have an independent chairman. In order to keep the individual annuity market alive amid economic turmoil, insurance companies will need to readjust their product risk, distribution and cost structures for the product, according to a report from Conning Research & Consulting. Citigroup has told US regulators it could fill the capital shortfall identified in the government’s “stress test” by selling large businesses, asking more investors to convert their preferred shares into common stock and reducing its balance sheet. Executives are trying to persuade the government Citi does not need more capital beyond its recent plans to bolster its battered balance sheet and cut costs. While some of the lenders may need extra cash injections from the government, most of the capital is likely to come from converting preferred shares to common equity, the people said. The Federal Reserve is now hearing appeals from banks, including Citigroup Inc. and Bank of America Corp., that regulators have determined need more of a cushion against losses, they added. ..
Analysts see possible scenarios for each of these to strike the U.S. economy. Stay alert and invest accordingly. Will the real 'flation please stand up? Experts are arguing about where the U.S. economy is heading as the global financial system tries to right itself. Is it on the path to inflation, deflation, or, worse, stagflation? Rising unemployment and excess production capacity are making it hard for the U.S. economy to climb out of recession. And that, in turn, is putting a strain on pricing power and wage growth—raising fears of deflation, which develops when a broad decline in prices amid falling demand feeds further price-cutting. While companies across the financial services industry were taking a beating last year, a firm in Waco, Tex., with a less than cheery way of making money was boosting its profit by 46 percent. Its niche: helping investors place bets on when people will die. U.S. life insurers, weakened by the global financial crisis, are in for mergers and regulators will not shy away from playing matchmaker to deal with weak companies, Eric Dinallo, New York's insurance superintendent, said on Tuesday. Americans are well aware that the struggling economy is affecting almost every aspect of their financial lives. From the stock market to home values to jobs -- all are caught up in the same global quagmire of uncertainty. But one financial issue that has yet to add to the fray is the cost of term life insurance. While some consumers are attempting to pay less for term life insurance by shopping around or decreasing coverage levels, they have not yet faced a drastic uptick in the basic costs. At the FinovateStartup conference, one thing is clear: a lackluster economy can be the best time for financial start-ups to get new users. Apps that help people track and manage funds outside of their bank or investment service's site are in high demand, and many of the services presenting at the conference are trying to get those financial companies on board. ..."After the recession of 2000-2002 the individual annuity market consolidated, globalized and created product guarantees to respond to high-net worth clients' heightened concerns over principal protection for high-growth variable annuity products," said Stephan Christiansen, director of research at Conning. "The resulting heightened risk profile left insurers vulnerable to the current severe market downturn. After capital raising activities in 2008 by many of these insurers, they must now plot a course forward and deal with the new realities of the market. We believe that capital strengthening will and must continue, but also that insurers will need to rethink their product risk, distribution, asset management functions, and cost structures in this new, and likely consolidating, environment..."
In advance of the Finovate ("Financial Innovation") conference that kicks off on Tuesday in San Francisco, I talked with Chris Larsen about his peer-to-peer lending company, Prosper. The prospects for peer-to-peer lending dimmed last year when the Securities and Exchange Commission decided to regulate some of the P2P financial instruments as securities; this forced P2P lending companies to retrench as they'd previously been treated more like banks. Prosper itself shut down its lending platform six months ago. Agent Sales Journal: Annuity Sales Guide, April 2009. Ameriprise Financial, Inc. has reported net income of $129 million for the first quarter ended March 31. In a release on April 21, the company noted the results represent a 32 percent decline from net income of $191 million for the first quarter ended March 31, 2008. Earnings per common share for the first quarter of 2009 were $0.58, compared to $0.82 for the first quarter of 2008. First quarter 2009 results reflect the significant decline in equity markets and the lower short-term interest rate environment. These two factors negatively impacted year-over-year results by approximately $0.62 per share. Double Indemnity is defined as an accidental death benefit that is equal to the face amount of a life insurance policy’s basic death benefit and is paid when the insured’s death is the result of an accident as defined in the policy. Established mutual fund companies will likely have to alter their sales practices as the growth of major brokerages slows and sales through registered investment advisors gain importance. Reports of the death of the wirehouses have been greatly exaggerated, but their growth is nevertheless expected to slow in coming years, said Maurice Leger, senior vice president and director of research at Boston-based Financial Research Corp. Fewer platforms for mutual funds will be available amid more wirehouse mergers and acquisitions, such as the spinoff of the Smith Barney retail brokerage into a joint venture with Morgan Stanley. Judging by the spate of news reports flying around financial circles it appears that after almost 200 years of gliding down the highway of steady, solid success, Hartford Financial Services Group (Hartford) is about to slip slide away into history. And it my opinion, nothing short of an Allianz SE buyout can save it. Bob MacDonald, former CEO of Allianz Life of North America and financial services contrarian, predicts that only a buyout by Allianz SE will save the Hartford Financial Services Group. John Hancock Financial Network (JHFN) is launching the Sales and Marketing Center, a website to help its national network of independent career firms and financial representatives increase their sales and grow their firms by sharing best practices. The comprehensive site offers firm- and representative-contributed concepts, turn-key programs and customizable marketing materials on many topics including prospecting, selling to existing clients, practice management techniques, branding resources to help with image building and recruiting and retention resources for local management teams. Consumers and professionals with an interest in long term care insurance need no longer dig so hard for information. Now they can do as the pros do: have the information come to them, in bits and pieces as it develops. "We're happy to share our secrets," says Jonas Roeser, Senior Vice President of Marketing & Operations for LTC Financial Partners LLC (LTCFP), one of America's most experienced long term care insurance agencies. Ace Ltd. has emerged as a possible bidder to acquire the property and casualty business of The Hartford Financial Services Group Inc., a US-based diversified insurance and financial services giant, according to a report by Bloomberg. Bloomberg reported that Allianz SE, Munich Re Group, MetLife Inc., and The Travelers Companies Inc. are also considered as a possible bidders for the insurance business. Citigroup, Inc. estimated that the business could worth around $4 billion to $8 billion. Hartford has retained Goldman Sachs to manage the sale process. Generation Y employees may have been hardest hit by the daily financial pressures exerted by the economic downturn of recent months. More than half (53%) of Gen Y employees (ages 21-32) say they are now living paycheck to paycheck – up from 50% in 2007 – versus 44% of their older associates. And nearly three in four (73%) are very concerned about having enough money to make ends meet, compared to 56% of Generation X employees and 62% of Baby Boomers, according to MetLife’s 7th annual Employee Benefits Trends Study. Has Globalization Made Us More Catastrophe-Prone? As the world grapples with the worst economic downturn in decades and the possibility of a flu pandemic, a growing body of research suggests the complexity of the modern global economy may make us more vulnerable than ever to catastrophe. The financial crisis began as turmoil in one small segment of the U.S. mortgage market. Within months it had morphed into a global meltdown affecting almost everyone on earth. "The speed at which these events unfolded was unprecedented," said the World Economic Forum's 2009 report on global risk, "It has demonstrated just how tightly interconnected globalisation has made the world and its systems..."
I&T: Has Globalization Made Us More Catastrophe-Prone? A case study in how to spread systemic financial risk. The cavalier use of brute government force has become routine, but the emerging story of how Hank Paulson and Ben Bernanke forced CEO Ken Lewis to blow up Bank of America is still shocking. It's a case study in the ways that panicky regulators have so often botched the bailout and made the financial crisis worse. Immediate annuities promise that your money will be there when you need it. But many investors are questioning how good those guarantees really are. The reality is that insurance companies offering annuities can, and have, failed. But policyholders can take comfort from a well-established, industry-financed safety net. Although investments aren't always covered in full, history suggests these annuities are about as safe an investment as you can get without the full backing of the U.S. government. WSJ: Buying an Annuity? Kick the Tires. The term "bailout" has taken on new meaning for financial advisers as they devise ways to free clients from underperforming variable annuities, but the path to freedom is paved with possible tax complications and worries about account churning. Aviva Plc, the U.K.’s biggest insurer, increased its capital surplus 25 percent in the past three months, easing investor concerns about the company’s ability to withstand declines in its investments. Thousands of military men and women could be owed money from a huge insurance settlement. The North Carolina Department of Insurance says the improper life insurance sales practices targeted servicemen and women. Officials say anyone who bought a Horizon Life Insurance policy from 2000 to 2006 should go online to see if they are owed any money from a major settlement. Officials say more than 4,700 troops and 800 civilians could be affected. For advisers, there's a funny thing about retirement income planning: The better you are at it, the less you stand to make. Thousands of financial advisers and hundreds of billions of dollars in assets at a number of financial institutions could soon be on the move as distressed firms look to sell off major brokerage and money management operations. Angry shareholders want Lewis ousted this week, but the rules make it unlikely he will be removed. ...Bank of America chief executive Ken Lewis and his board of directors face significant opposition heading into Wednesday's shareholder meeting, but experts and activists say the bank officials have one major advantage: The rules of the game are in their favor. Lewis and all his directors must stand for re-election at the meeting. But a big chunk of the votes will be cast by stockbrokers on behalf of their clients, and they typically back management. Also, companies have the right to adjourn their annual meetings so they can drum up more votes in their favor. And even if shareholders vote out a director, the board still has the final say on whether that director has to go. A legion of intrepid financial advisers are twittering, linking in and in many other ways harnessing the power of the Internet to network socially in a bid to expand their practices. They are making use of social-networking websites to attract clients, to develop relationships with accountants, attorneys and other advisers, and also to display their expertise. Industry veteran Deborah McWhinney has been given the reins to lead Citigroup Inc.'s efforts to expand its wealth management service and premium personal banking services. Aviva said Monday that worldwide sales were up 5% to GBP10.313 billion. Life and pensions sales was up 11% to GBP9.569 billion and group margin in line with full year 2008, it said. Four years ago, Eliot Spitzer, then the New York attorney general, asked several national banks to explain why they were disproportionately charging blacks and Hispanics high interest rates. Instead of an answer, he got a lawsuit. The banks, and the Treasury Department agency that regulates them, persuaded federal courts to bar the state attorney general from enforcing New York antidiscrimination laws. When federal regulators forced National City Corp. to sell itself in October, the head of another struggling bank right across the street watched from his office window as television crews swarmed. Standard & Poor's Equity Research Services released MarketScope 3.0 (MSA), a platform that provides financial advisers with investment intelligence and tools about multiple asset classes. The firm said the tool is in response to increasing numbers of advisers using a comprehensive wealth management approach to serve their clients' needs. Standard & Poor's said it will provide expanded coverage across the entire wealth management spectrum of products and asset classes including stocks, exchange-traded funds (ETFs), mutual funds, variable annuities, and fixed income, according to a news release. Michael Bonevento, a senior financial advisor at Ameriprise Financial Services, Inc.,warns that most Americans are vastly underinsured, which means if disaster strikes, their loved one would be left in financial disarray. He recently spoke with U.S. News about the benefits of taking an unemotional, mathematical approach to help avoid some of the paralysis people tend to feel when talking about life insurance. Fixed annuities fell out of fashion when the stock market was rising, but are getting a second look these days from investors whose retirement accounts were battered when stocks tumbled. "This economy has caused people to fear outliving their money," said Carrie Coghill Kuntz, president of wealth management firm DB Root Co., Downtown. "An immediate annuity takes away that fear because the insurance company promises to pay until a person dies." 57.6% of Americans say they don't have a voice anymore and too much is being dictated out of Washington, according to the April American Pulse™ (N=4023). On the other hand, a quarter of participants (27.2%) say their voice is being heard, while 15.1% aren't sure. In a government with a Democratic stronghold, it's surprising that 42.8% of people who consider themselves of the Democratic Party don't think they are being heard on Capitol Hill. 74.5% of Republicans and 63.8% of Independents feel the same. Madoff is behind bars and isn't talking. But a Fortune investigation uncovers secrets of his massive swindle. The employees were transfixed. Standing on the mid-Manhattan trading floor of Bernard L. Madoff Investment Securities in late 2007, a half-dozen staffers stared up at the ceiling-mounted TV as CNBC aired a report on the mysterious Palm Beach death of a hedge fund manager who had been leading a double life. The police, it appeared, were even considering the possibility that he had been murdered. "Bernie," someone casually asked as Madoff happened to walk by, "have you heard of this guy?" Madoff glanced at the screen, blanched, and exploded: "Why the f*** would I be interested in some s*** like that?" The employees recoiled. "I never saw him react like that before," says a Madoff trader who witnessed the outburst. "It obviously hit a nerve..."
A new survey by J.D. Powers and Associates shows that customer retention has become crucial for insurers in light of the current economy. The report finds that in the past 12 months, 30 percent of households with annual incomes below $50,000 shopped for a new insurance carrier and 45 percent of those customers eventually switched carriers. In contrast, only 26 percent of more affluent households (those with incomes of $100,000 or more) shopped for a new carrier, with only 31 percent of shoppers eventually switching. "While 90 percent of customers overall stayed with their insurance carrier during the past 12 months, those households that are potentially more impacted by the recession present a real challenge for insurance carriers," says Jeremy Bowler, senior director of the insurance practice at J.D. Power and Associates. "Although several carriers in the industry—including Auto-Owners, GEICO, Liberty Mutual, Progressive and Travelers—have managed to grow their customer base in this challenging economic climate, their growth comes at the expense of other insurers in the mature U.S. personal auto insurance market..."
American Express Co., the biggest U.S. credit-card company by purchases, beat analysts’ profit estimates and said that it intends to repay the government’s rescue-fund investment. The bank rose in late New York trading. iPipeline ...today announced an upgrade to LifePipe™. LifePipe provides more than 850 distributors with access to iPipeline’s leading term quote engine as well as carrier rates, forms and underwriting guidelines. The upgrade, available April 27th, now allows an agent to launch into iGO e-App™, an intelligent fillable form, and auto-populate the form with quote information. Agents using iGO e-App increase productivity, accelerate the sales process and, as a result, report an average increase in sales of 25 percent. Hartford Financial Services Group Inc. is seeking bids from rivals including Travelers Cos. for its flagship property insurance business, said people familiar with the matter, in a sign that damage from the financial crisis may lead to a wholesale breakup of the 199-year-old insurer. New Report: "Reinsurance Carriers in the US - Industry Market Research Report"
INN: New Report: "Reinsurance Carriers in the US - Industry Market Research Report"
Acorn Capital Management L.L.C., the Kennett Square investment firm whose assets were frozen by the Securities and Exchange Commission on Tuesday, had a peculiar investment portfolio, according to its last quarterly SEC filing. Acorn told the SEC it had invested $58 million in client funds in 82 stocks, from Abbott Labs to Zoll Medical. Not an unusual profile for a smallish firm. Fitch Ratings believes that the possible inclusion of life insurers in the U.S. Treasury Department's Troubled Asset Relief Program (TARP) could be a positive development for those eligible life insurers and therefore could temper future downgrades if more capital pressure develops than anticipated in current ratings. Fitch believes that government funding would provide a source of financial flexibility not currently available in the capital markets for life insurers. It's an unavoidable fact of life: Life insurance premiums increase with age. And then there's the matter of your health. If you develop certain medical conditions, life insurance suddenly becomes prohibitively expensive, if you can get it at all. For good reason, then, people seek insurance that can be renewed regardless of any changes in health. That's where a renewable term life insurance policy can be a lifesaver (for your survivors, at least). Many insurers are feeling a financial squeeze, and you're worried that your life insurance policy or annuity isn't safe. ESPlannerBASIC, a free online version of a powerful financial-planning service, has just been developed. Now that the investment dust and damage of the past 18 months is settling, this is an excellent time to take an honest look at your financial future. ESPlannerBASIC is financial planning software that's worth your time and effort. Morgan Stanley (MS) recently recruited Irl Solomon, an investment representative, from Credit Suisse Group (CS) and added financial advisers from UBS AG (UBS), Merrill Lynch Global Wealth Management, Wachovia Securities, and Wells Fargo & Co. (WFC). Morgan Stanley Chief Financial Officer Colm Kelleher said Wednesday the investment bank is interested in acquiring a retail bank that caters to high-end customers. Citigroup Inc. (C) took a step towards growing the wealth management business it keeps after the brokerage joint venture with Morgan Stanley (MS). Tax-free bonds offer some nifty bargains. Forbes: Munis: Better Than Treasuries? What creates the need for a Structured Settlement? If you or a loved one has been in an accident resulting in a personal injury and you are in the process of negotiating a settlement, you are about to make decisions that could impact you financially for the rest of your life. ...Some ...annuities guarantee a certain amount of income in retirement (GMIB), or withdrawal benefit (GMWB), or accumulation (GMAB). In developing these products, insurers and others have tried to show that these annuities, when used in combination with other investments, can help retirees deal with many of the risks faced in retirement, particularly market and longevity risk. But, until recently, these products never took flight. Investors found them complicated, lacking transparency and laden with fees. In addition, experts often criticized insurers for mis-pricing the products, first making them too expensive and then too cheap. Implications: First and foremost the mutuals do not have the market pressure of the publicly traded insurance carriers. Second the have, by and large, strong risk based capital (RBC) ratios. Finally with career or tied advisors they can weather the storm because the advisors will stay loyal. Analysis: The rating agencies seem to be over reaching with their latest round of downgrades. Mutuals are traditionally more conservative in the deployment of their capital then their publicly traded counter parts. Life insurance holders are opting to trade in their old policies for new, better designed or more conservative policies issued by companies in solid financial health these days. But they’re holding on to their variable annuity contracts, as buying new ones in the midst of a big equity market decline might result in a decline in principal. Plus issuers are raising fees and cutting back on benefits. Indeed, tax-free 1035 exchanges of life insurance policies are rising, while the pace of 1035 exchanges for variable annuities has slowed. The Securities and Exchange Commission said Monday it has charged Acorn Capital Management and its principal Donald Anthony Walker Young with misappropriating more than $23 million in client assets through a Ponzi scheme. With hurricane season approaching, Floridians face increasing risks from poor public policy that makes it difficult to protect their homes. The state has watched Allstate, Nationwide, Prudential, USAA and State Farm leave in the face of excessive regulation. Underfunded, state-run Citizens Property Insurance Corporation has become the largest insurer in the state, with the highest risk exposure. When a major storm hits, all insurance customers could face a significant state "hurricane tax." The Guardian Life Insurance Company of America (Guardian), one of the largest mutual life insurers and a leading provider of employee benefits for small and mid-sized companies, today announced new value-added features not often available to smaller companies to its group life and disability portfolio. The ratings of North Coast Life were placed under review with negative implications on November 21, 2008, following a significant decline in its total capital through third quarter 2008, due to investment related realized and unrealized losses. The impact on North Coast Life's already low capital base brought it close to a regulatory minimum for a key state of operation. The Federal Home Loan Bank of Cincinnati approved Columbus Life Insurance Co. as a new member. The company is the 22nd insurance company to join the FHLBank, a congressionally chartered wholesale regional bank that provides financial services to member instutitions in Ohio, Kentucky and Tennessee. Think financial jobs are scarce? Think again. As wave after wave of layoffs hit the financial firms, there is one financial job that just can't attract enough applicants to fill the openings: financial adviser or broker. According to industry insiders and consultants, nobody wants to be a stockbroker these days. According to Cerulli Associates, nearly half of all financial advisers today are over 50 years old. And that aging talent pool isn't being replenished with young blood: Less than 5%, or just 15,000, of the 298,000 U.S. advisers are currently 30 years old or younger, according to Cerulli Associates. "Long term, this will definitely kill us," says Fusion Advisor Network's Philip Palaveev of the dearth of young-blood flowing into the business. "When this wave of advisers over 50 years old tries to retire, how will we absorb the clients that they leave behind..."
Southwest Florida residents are calmly reconsidering almost every aspect of their finances in today's challenging economy, judging from calls taken by financial planners Sunday at The News-Press. About 200 people called in Sunday to ask questions of members of the Financial Planning Association of Southwest Florida. Mergers and acquisitions in the U.S. insurance industry lost value last year, while non-U.S. transactions plummeted, according to data from Conning Research and Consulting. Last year ended with more acquisitions for the overall industry around the world, totaling 766 transactions, compared with 750 transactions in 2007. However, deal values took a major slide, worth a total of just $55.5 billion, compared with $138 billion in 2007. Irrevocable life insurance trusts can be a very powerful estate planning tool if structured properly, and used in the right situation. Practicing attorney, John C. Martin, gives us 5 different ways a irrevocable life insurance trust can super charge an estate plan, in his article below from JD Supra. What is an irrevocable life insurance trust (“ILIT”) and why would it be useful to me? This article explores the upsides and downsides of the “ILIT.” The author concludes that an ILIT is both a cost-effective and powerful tool for providing liquidity, paying estate tax, avoiding Generation Skipping Transfer Tax (GSTT), protecting beneficiaries from creditors, and for business owners, keeping a business in the family. Two insurers and an insurance administrator have agreed to end litigation over the sale of long-term care insurance policies by entering into settlements valued at $15 million. The settlements affect hundreds of Missourians who bought policies from American Heritage Life Insurance Co. and Wakely and Associates Inc. The policies were co-insured by Mutual of Omaha Insurance Co.
"The finger's come off the panic button," says John Fennelly, global managing director of the wealth management markets division at Thomson Reuters, of the economic environment surrounding the wealth management business. "In September through January, everybody was extremely nervous; who knew what equilibrium would look like?" We spoke with Fennelly this morning in his large, glass-enclosed office overlooking Times Square about the current state and future of his group a year into the merger between Thomson and Reuters. The nation’s biggest lenders and other financial institutions, including Bank of America Corp. and Wells Fargo & Co., reduced their political giving even as Congress began to consider how to re-regulate their industry. Donations from the political action committees of 10 of 12 firms facing so-called stress tests by the government dropped to $231,750 in the first quarter of 2009, compared with $826,180 in the same period two years ago, Federal Election Commission records show. Just two companies increased their contributions. Bank of America Corp. posted a first-quarter profit of $4.2 billion that nevertheless cast fresh doubt on the health of U.S. banking industry due to the depth of problems in many of the company's core banking businesses. Treasury Secretary Timothy Geithner indicated that the health of individual banks won't be the sole criterion for whether financial firms will be allowed to repay bailout funds, a position that might complicate their efforts to give back the cash. The Phoenix Cos.' pursuit of federal bailout funds has hit a wall as the federal government seized the ailing bank that the Hartford life insurer planned to buy to qualify for the money. The federal Office of Thrift Supervision (OTS) closed American Sterling Bank of Sugar Creek, Missouri on Friday and appointed the Federal Deposit Insurance Corporation (FDIC) as receiver. Prudential Retirement was ranked first among its peers in offering plan participants, plan sponsors and financial consultant communications that best meet their needs. Prudential Retirement led retirement plan participant providers in DALBAR's 11th Annual Trends and Best Practices in Investor Communications Report. DALBAR is the leading evaluator of financial and investor communications. For years, many retirees were content to act as their own pension managers, a complex task that involves making a nest egg last a lifetime. Now, reeling from the stock-market meltdown, many are calling it quits -- and buying annuities to do the job for them. ...Guaranteed variable annuities are an easy sell to baby boomers looking for certainty in retirement, but they require insurance companies to juggle a series of put options and complex structured securities that revolve around stock prices and mortality. Much like the role subprime mortgages played in banking, these guarantees helped insurers boost sales and gain market share while times were good. But they also left life-insurance companies exposed when the music stopped. Is it time to shift out of defensive stocks? In order to best position yourself to participate in a stock recovery, it's better to buy cyclical stocks like tech, manufacturing and other industries that rely on economic growth as the global recession moves closer to an end. Observer: Is it time to shift out of defensive stocks? As part of a massive overhaul of its U.S. wealth management business, UBS AG is set to shed up to 2,000 jobs, shrink its regional operations and consolidate a number of branches here over the next several months. ...Many life insurance companies and pension funds have invested aggressively in shopping center mortgages for many decades. Some of these loans were, and are, self-amortizing over the term of the loan, but some have maturity dates of, say, ten years, leaving a substantial “balloon” amount still due. The expectation has been that the unpaid amount would be refinanced (“rolled over”) into a new loan at that time. The plan works just fine when credit is loose. It doesn’t work so well when credit is tight. Citigroup’s global wealth management division suffered a $40 billion net outflow of client assets in the first quarter of 2009. The division also had a net loss of 2582 financial advisors over the past year. A national insurance company is being sued for millions of dollars for selling fixed-payment health plans that, according to plaintiffs, violated minimum standards in Washington and had not been authorized by the state. The rigid credit market is hitting term insurance premiums, reversing a long downward trend in the cost of one of the most inexpensive forms of life insurance. American International Group Inc. agreed to sell its U.S. auto insurance business to Zurich Financial Services AG for about $1.9 billion, the firm’s biggest divestiture since being rescued by the government. Given strong demand for retirement products that offer downside protection and growth potential, target-date funds and annuities would seem a great match. But many insurers remain leery of target-date funds, analysts said. They said Prudential Retirement is the first to offer a product that combines them with annuities. Fitch Ratings downgraded its insurer financial strength rating on Lincoln National Life Insurance Co. to A+ (strong) from AA- (very strong) on Thursday, and lowered debt and default ratings of parent Lincoln National Corp. Responding to a lawsuit filed by annuities issuers and marketers, the U.S. Securities and Exchange Commission filed a legal brief saying its decision to regulate equity-indexed annuities as securities, not insurance products, is a reasonable interpretation of securities laws. "Better to forget AXA and try something else"
Dear Mr. Berko : Please tell me what you think about AXA's variable annuity. I may invest one-third of our assets, or $78,000, in this as a hedge against inflation, because I think we could experience hyperinflation in the coming 18 months. Our broker says AXA is the finest annuity I can own and the best hedge against inflation I can buy. However, I noticed that AXA stock collapsed from $40 to $7.50, and this makes me worry about the safety of the annuity. My broker told me that the reason AXA fell so much is that all financial stocks have done poorly this year. The broker insists AXA is as strong as a horse. Please give me your thoughts on AXA's variable annuity and its potential as a hedge against hyperinflation. If you don't like AXA for annuity inflation protection, what would you own? New York Life Insurance Company announced today that it has increased the number of sales and service staff in the bank channel. The number of internal sales specialists increased by 100%, regional wholesalers by 30%, retirement income specialists by 50%, and other service staff by 40%, for a total of more than 100 new hires. "Sales of New York Life's fixed annuities in the bank channel have surged, up 130% and sales of income annuities almost doubled in 2008, fueling the need for growth in sales support. Now more than ever, consumers are conscious of the need for a safe place to grow their retirement income. Our sales growth is evidence of this flight to quality: bank clients recognize that fixed annuities from New York Life, a financially stable, triple-A rated company, offers that stability and growth potential they seek," said Andrew Reiss, vice president and national sales manager for New York Life's bank channel. "New York Life is committed to providing the highest quality products and service and by expanding our sales support team will best be able to meet the growing need in the bank channel for quality retirement planning expertise..."
American workers still see the value in retirement savings plans—and most of them continue to contribute to them. That’s the good news from Transamerica’s Retirement Survey, released yesterday. The survey, which questioned 3,466 full- and part-time American workers, was the tenth version of the report. More than $2 trillion of American’s retirement assets disappeared in just one year and who knows what’s going to happen next. In today’s changing economy, even the wealthiest Americans worry about running out of money in retirement and wonder how to keep dreams of retiring alive. Other life insurers would probably join MetLife in turning down federal bailout funds, and only the most stressed companies will take the money if it's offered, analysts are predicting. U.S. life insurers, a group led by MetLife Inc. and Prudential Financial Inc., face “unprecedented stress” on holdings in bonds and commercial mortgages in the next 18 months, Standard & Poor’s said. Moody's Investors Service on Wednesday cut its ratings on Lincoln National Corp. (LNC) and warned of possible further downgrades if the insurer's earnings continue to decline on investment losses. ...MetLife's shares have fallen 24% this year, less than the 31% decline of the S&P 500's insurance-company index. Lincoln National has plummeted 50%, and Prudential has slipped only 16%. Where does that leave MetLife? UBS AG, Switzerland’s largest bank, plans to cut another 7,500 jobs, bringing total staff reductions to almost 20 percent of the workforce, amid mounting losses and customer defections. The crisis persists. Our 17-month- old recession is deepening by the month. The unemployment rate rose to 8.5 percent in March, with 12.5 million Americans unemployed while millions more have stopped looking for work. ...The potential for a national bank run is real. The Federal Deposit Insurance Corp. has $35 billion in reserves to cover some $4 trillion in potential liabilities. A massive run would require the Fed to print the difference. This would trigger hyperinflation and justify running to spend one’s money before prices rise. Open your mind to both investment approaches. Morningstar (CA): Active or passive? 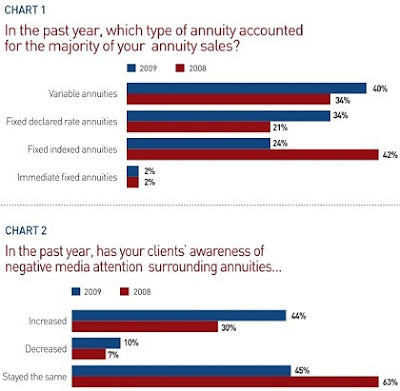 Last year was dismal for the U.S. variable annuity industry. Fourth-quarter sales of these stock-market-linked, retirement-income products declined to $33.3 billion, a 30.3% decrease. Sales for the year declined 15.1% from year-end 2007 to $154.8 billion, according to NAVA and Morningstar Inc. The stock market isn’t the only thing hitting new lows: The retirement expectations of the vast majority of Americans set a record-low this year, with only 13 percent of American workers saying they are very confident of having enough money to live comfortably in retirement. According to the 19th Annual Retirement Confidence Survey (RCS) released today, retirement confidence among workers has tumbled by 50 percent in the last two years. Lying about cancer for financial gain? Oak Ridger: Lying about cancer for financial gain? Lots of clients are frozen mentally where long term care insurance is concerned. Like deer caught in headlights, they do not seem to want to complete or even talk about the financial moves they desperately need to make; they are scared or uncertain. LTC, annuity and life insurance combination products, along with good old fashion needs-based selling, are the perfect tools to use to get these clients out of their headlight frozen positions.